What is the Extension Method in C#? I often get questions about the Extension Method in C#. 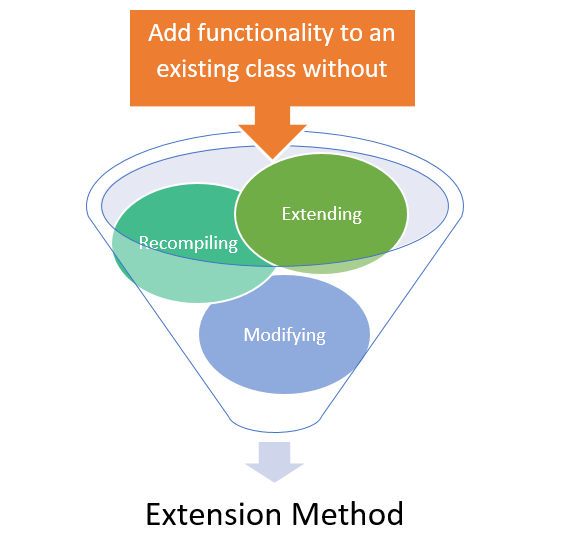 The Extension Method was introduced in C# Version 3.0. and allows us to add functionalities in an existing class without modifying it, extending it, or re-compiling it. Extension methods are a special kind of static method but can be called on objects like an instance method. So, an extension method can be used in the same way as normal instance methods. Step 1: Define a static visible class which will contain the Extension Method or Extension Methods. Make sure the class is visible to the client code by applying the appropriate accede modifier. Step 2: Create a static method with at least the same visibility level as the containing class. Step 3: The first parameter of the Extension Method always specifies the type method operates on. Make sure the type name is preceded with the “this” modifier. Step 4: In the calling code, add the namespace that contains Extension Method class. Step 5: Use the Extension Method on the type in the same instance method can be used. Keep in mind that we do not need to pass the first parameter because that denotes the type, however we should pass the second parameter onwards to call the extension method.